CHILLS AMERICANA ONE PACK 1 1/2 Slow Burn HEMP ROLLING PAPERS. Chills Americana 1 1/4 Hemp Rolling Papers ONE PACK. 33 leaves a pack. 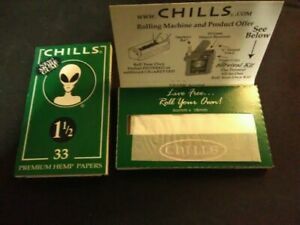 CHILLS ALIEN: ONE Pack Premium HEMP Papers Slow Burn 1-1/4 32 leaves a pack. jejefwi-p5mho3iz has no other items for sale. Details about CHILLS Green 1 1/2 Slow Burn HEMP ROLLING PAPERS. ONE PACK. CHILLS Green 1 1/2 Slow Burn HEMP ROLLING PAPERS. ONE PACK.